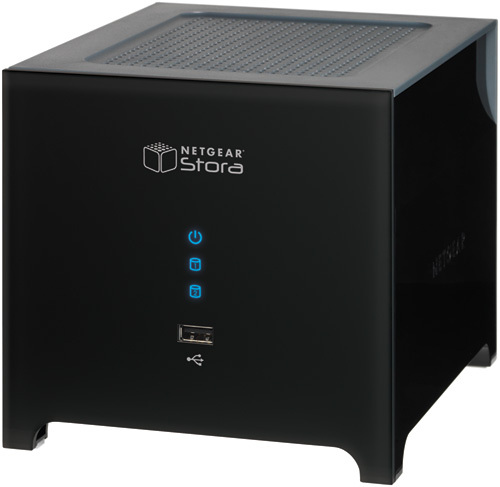 I bought a Netgear Stora MS2110 NAS (Network Attached Storage) device a few months ago for the dual purpose of using it as a cheap easy backup unit with built-in mirror RAID and a home media server to store my digital photos, videos and music so they could be streamed to other networked devices in my home. Upgradability. So in the future I could replace both 1TB hard drives with two 2TB drives. Update: I recently replaced the existing 2 1TB hard drives with 2 Western Digital 2TB drives. At the moment the only choice if you put in 2 drives is automatic backup. A future firmware upgrade should enable JBOD (just a bunch of drives) feature so if you put 2 drives into the Stora instead of mirroring them it accesses the drives as one big combined drive. UPDATE: this is now an option. The setup process requires a serial number for the software and the number is hidden underneath the Stora where you’d least expect it. It should be on top or on the side. I wish it had 2 hard disks already in it to make it simpler for mums and dads as a ready to to use backup solution without having to buy another drive and install it. I thought I had to turn the Stora off through it’s software interface but it turns out pressing the power button for 5 seconds turns it off. This should have been clearer. You can see speed tests comparing the Netgear Stora MS2110 to other NAS devices in PC World Australia’s review. Hi Neerav, I too am looking at a single storage solution for my home and business (separate small office). The price is right for me but I am a little concerned it might be a dog of a buy. How are you finding it now? Can you access your files over the internet using this NAS? And it seems you suggest I should get another hard drive so I can back up the back up? Did it take long to set up? And does it take time to access the files when using your laptop or PC to access? EDITOR: yes you access your files over the internet using this NAS, but only from a computer/device with Adobe Flash. If there are problems using time machine to back up with the stora, this thread has some workarounds (I have yet to get this working – it seems you need an ethernet connection to get this to work). Great review, thanks Neerav. I have been looking at these for a while. I ended up going with the HP Home Media Server at home, but this may be perfect for the NFP that I am working with. I’ve found wifi on mac to be too flaky to use for a full backup, and am inexplicably low limit on the time machine volume – it’s an inflexible 250GB, so it can’t back up my mac mini. With Ethernet, and for manual copying, though, it’s been good. I just thought I would make a note, since I read your review and was misled. The base Stora model *does* have a fan. It’s pretty quiet but I actually was after a fanless unit. Perhaps the higher mode, which you reviewed, does not have a fan at all.